When it comes to producing compelling content (an article, blog entry or branded piece), it never hurts to support your topic with an interview or sound bite from a respected voice in the field. Don’t get me wrong: I’m not suggesting you yourself are not respected. You are a solid person. However, in this era of societal ADD and trumped-up sensationalism, the more substantive your piece is, the better off you’ll be when it comes to winning your reader’s time and attention – especially if you want them to engage and share it with friends on Facebook. After all, nobody wants to be relinquished to a one-second fly-by in a news feed… am I right? One way to up your piece’s cache is to land a person of note: a celebrity, tastemaker, influencer, or even just a superstar in their respective field. In my career, I’ve interviewed hundreds of celebs, pro athletes, authors and experts who’ve gratefully taken the burden off me – the writer – to be interesting alone. Steve Carell, George Lopez, Eva Longoria, Suze Orman, Sugar Ray Leonard, Magic Johnson… They’ve all been on the other end of my interrogation skills. A humble brag perhaps, but mostly just proof that if you put the work in, target smartly, make the right calls (and ask the right people… the right way), you could land a big fish worthy of the impressions, clicks and shares you’re trying to generate with your content. Sound good, but not sure where to start? No sweat. If you want to book a big name interview, here are eight things you’ll want to get down pat to do just that. 1) Get your elevator pitch down. Whether you’re emailing a publicist or pitching a rep over the phone (yes, actually using a phone to talk can be a good thing), you’re going to want to get your elevator pitch down. I’ve crafted probably a thousand of these pitches over my career and can tell you that a quick-and-dirty 30-second plea concisely explaining who you’re requesting an interview with, what your angle is, and where this content will appear… may be the most important part of this interview-landing equation. Better make it compelling and typo free. That last part – the ‘where’ part – is especially important because I can almost assure you the first question out of a rep’s mouth will be: Where’s this interview going to live and what are the traffic numbers for that site (or publication)? Have these figures handy, and if you don’t think your outlet (or traffic) are impressive enough to get a ‘yes,’ go to plan B. That is, make a sincere and authentic plea – not demands – and remember to be polite, respectful and charming (if that’s a skill in your bag of tricks). Do this and you never know what the answer will be – because, at the end of the day, you’re giving the interview subject free publicity. So, if your request is easy to accomplish, you might just get a phoner or email interview out of them. You won’t know unless you ask. 2) Work every angle possible. Agents. Managers. Publicists. These are what are known as the talent’s “people”… and they’re the people you’ll be sending your pitch to. They serve as the first line of defense to screen out the riff-raff and ultimately, have access to the talent and the power to greenlight your request. They are your new best friends. Make them like you. Hire a hypnotist, do whatever it takes. Better yet, if you happen to know somebody who knows them or the person you’re targeting, work the angles! Name drop as if your life depended on it. Having a connection to the person you’re requesting an interview from will almost always up your chances of success. Having someone do a favor for a friend is a great way in – and could fast track your request. This is how I got to interview ‘The Biggest Loser’’s Jillian Michaels and ‘Dating Naked’ star Chris Aldrich. Two friends of mine were producers on these shows and were able to pave necessary in-roads. As for non-traditional approaches, you hear stories (i.e., bribery in the form of Scotch, unannounced pop-ins, stalking, etc.). I’m always a fan of creativity when it comes to standing out, but remember, not going through the “proper channels” can work wonders, or backfire. Use your best discretion for what will work best. The idea is to stand out so they remember you and have a hard time saying “no” to your airtight pitch… not to get a restraining order filed against you. You’ve sent your pitch, but the request is now just seemingly wafting away in the great internet abyss of unreplied-to flotsam. Important people and their reps are incredibly busy, so don’t be deterred if you didn’t get a response. The more impressive the celeb or expert, the more they and their people have to attend to on a daily basis. If they don’t respond to your first email, don’t take it personally. Conduct a polite follow up. Pick up the phone and make a call referencing the email sent previously. Be patient. Give it a few days. If you’re on a tight deadline, you’ll want to include that in your original note with a reply-by date. This will serve as a ticking clock for them to give an answer. And if you don’t get an answer by that date, well then, you have your answer. Truth be told, your best bet to land a celebrity of note is to get them when they’re in a promotion window. That is, they have a new movie opening; a new show; a charitable cause to promote; or a new book coming out. If so, it’s in the tastemaker’s best interests to do interviews to get the word out. In fact, they may even be a contractually obligated to do so by a movie studio or publishing company. Recognize who’s doing this… and pounce. In this day and age, having a fresh piece of content to promote is social currency more valuable than bitcoin – so they’d be fools not to entertain your opportunity. Check out upcoming movies, new book release lists on publisher’s websites and keep an eye out for who’s more likely to be doing the interview circuit. Read stories online, watch late-night TV, peek at your news feed. In other words, look who’s talking, listen to what they’re saying and use that information to craft your pitch to their rep. I mined this fertile terrain for years in hopes of landing big name interviews for outlets and it worked for me. From world-class survivalist Bear Grylls (who was launching a show on NBC) to Nick Offerman, who I found out was going to be at the American Greetings booth at CES 2017. To get Offerman, I connected with the publicist before the event and arranged a slot after his press conference. Ultimately, Offerman gave me great content on the fly for Uproxx. Recognize who’s making themselves available for interviews – you may just get one. 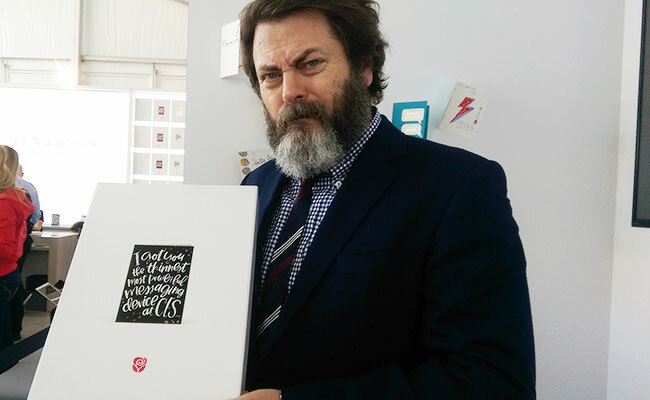 Nick Offerman in the American Greetings booth after our interview at CES 2017. The Nick Offerman thing reminds me: Sometimes getting a big interview is about being in the right place at the right time. Find out where celebs are going to be and find out how to get there. Getting a press credential to the event is the most logical step in this process. But it’s not the only way. Approaching people in person, whether you’re press or not, can also work. Even if the person you’re trying to land doesn’t have time to give you an interview on the spot, introduce yourself, your outlet and cause. They might verbally commit to doing an interview at a later point. If that happens, follow-up with their rep the next day and reference said conversation. Tell the rep that you met the celeb at yesterday’s event and they told you they’d be game to do an interview in the future. It’s way harder to back out of something the talent verbally committed to than to decline involvement in the first place. This approach is not a slam-dunk (the celeb may’ve been drunk or reluctant to say ‘no’ to you) when they agreed to do it, but it will certainly give you an edge if a verbal commitment was made. Work it – it’s way better than a cold call. 6) Ask the right questions. You’ve landed a person of note for your content piece. Congratulations! You’ve done the hardest part. Now, the easy part: Figuring out what to ask him or her. Well, maybe not so easy. It’ll be tempting to convince yourself that simply sitting down for a conversation will be enough to elicit good answers. Don’t fall into that trap. It’s dangerous and runs the risk of leaving you without the answers you need, a.k.a. anything good. Not to mention, the more impressive the person is, the more limited their time will be. Ultimately, there’s nothing worse than trying to shoehorn an off-topic sound bite into a piece. It’s a wasted opportunity that could leave you with loads of interview regret. 7) Be a master of time management. Speaking of, letting talent go on and on about their dog’s Instagram following is cute, but don’t fall into this trap. You’ll probably never use a Scruffy quote in your story about “Masterful Branding” and time is always short. One time I was interviewing a person I shall not name and he actually found a reason to call his sister during the interview, seemingly checking an item off his to-do list. That was awesome. The piece was not, in fact, about sibling relationships. Make sure you have time to ask the questions you need to ask, but also leave time for followups. I had to learn that one early in my career. I use to arrive with a bullet-point list of questions and would work my way down it regardless of what was being said. Don’t do that. There’s something to be said for flow and ensuring the talent enjoys your talk. Do that and they’ll be way more likely to give you good answers and maybe even more time for the interview. Interrupt them every five seconds to ask your next question and you could ultimately experience what I call “tape shock.” That’s the moment you get home, listen to your audio and realize it’s riddled with non-sequiturs and that your subject secretly hates you because you interrupted their flow almost every time they spoke to ask something completely non-related. Preparation includes technical aspects, yes (i.e., making sure your cell phone is charged; your voice recorder has batteries; and that you have the talent’s right phone number or Skype name). It also means you should become an expert on the person you’re interviewing. Read everything about them – about their upbringing, current projects, former ones, pet projects, causes they support, etc. Do a deep dive that probes deeper than a colonoscopy. Get up into every nook and crevice of the web, digging for pieces on this person and reading former interviews to educate yourself. Once you do that, you’ll be way better informed to write questions that matter – and not regurgitate what’s already out there. Not only will the talent respect you for having done so, but chances are they’ll give you better answers as a reward. And at the end of the day, isn’t that the point – getting great content? 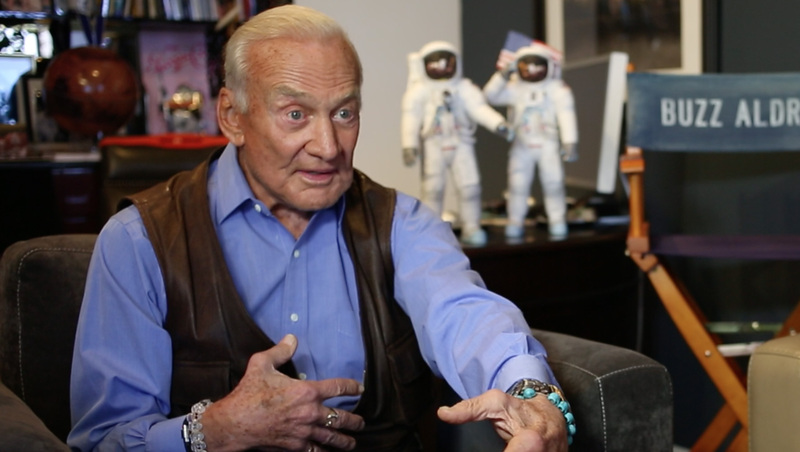 Astronaut Buzz Aldrin shares some of his favorite places to space out on planet Earth. When I first tried to land the man responsible for our country’s first moon landing (in part) for an interview, my first thought was… It’s never going to happen. After all, Buzz Aldrin was 84 (at the time), an American icon and probably had way better things to do than sit down with a camera crew for YP.com (YellowPages.com). But I went for it anyway without letting my doubts preclude me from trying. I picked up the phone, found a way to get his manager on it, and used my previously described approach to get him to carve out an hour for a coveted interview. Turns out, Aldrin was promoting a YouTube video he was putting together around the 45th anniversary of the moon landing and the timing was right. Like the Apollo 11 mission, I took bold steps, trusted the journey and ultimately, was fortunate to land a great man for a great interview. Buzz later posted my complementary article for the interview on his own website: Buzz Aldrin’s Five Favorite Places to Space Out on Earth.